MY SIDE OF THE RIDE: Bicycling And Forest Fires....Not A Good Mix. Bicycling And Forest Fires....Not A Good Mix. "You can't be a real country unless you have a beer and an airline - it helps if you have some kind of a football team or some nuclear weapons, but, at the very least, you need a beer." Well, once again a quote completely unrelated to this post, but I like it. Perhaps its application to Silver City, NM, is that this can't be Silver City, NM, without a forest fire. Last Friday, for the first time in I cannot remember, it rained. Unfortunately, along with the rain came thunder, which also meant lightning. The area surrounding Silver City is bone dry. And three fires were ignited due to lightning. Two of them were put out. The Silver Fire is still small compared to last year's fire here. 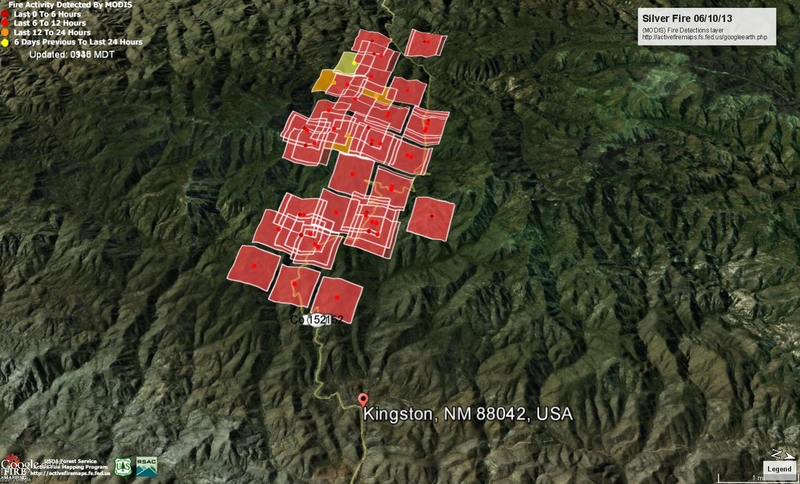 Kingston, NM, has been under mandatory evacuation orders since just a few days after the fire started. This area hasn't had a fire since 1925, which means there a vast amount of "fuel" there (READ: every damn thing around it is dry and ready to burn). Personnel were being flown in to areas they'e unable to reach by ground and brought directly to the fire zone. The fire had been fought primarily with air tankers and helicopters dropping fire retardant. Rt. 152, which goes through the Black Range, right by this fire, is closed. This road is part of the Adventure Cycling Association Southern Tier Route, so any touring cyclists coming through will have to route themselves via Rt. 180 and head to Deming, NM, then cut over to Hatch, NM, and pick up the Southern Tier Route there. Although, with the high temps in the Arizona desert during the summer, no sane individual would be riding the Southern Tier Route West to East...except for Julian Wong, who is carrying his father's ashes back to Southern China by bicycle. He's due in Silver City within the week. The red area in the photo above is directly on top of the Black Range and Rt. 152 goes right through there. The top of the photo is facing West. Kingston is at the base of the East side of the mountain. If the weather pattern follows as it should (the "as it should" part is critical), the monsoon season will start the end of June/first part of July. That means sun/blue skies in the morning and rain/thunder/lightning starting in early afternoon, clearing up by early evening. This goes on pretty regularly through July, August, and into September. For the past few years, however, ...of course there's no global warming, ok?...this pattern has not held consistent, as it had in the first part of the 21st century. This area has been, and is, parched.